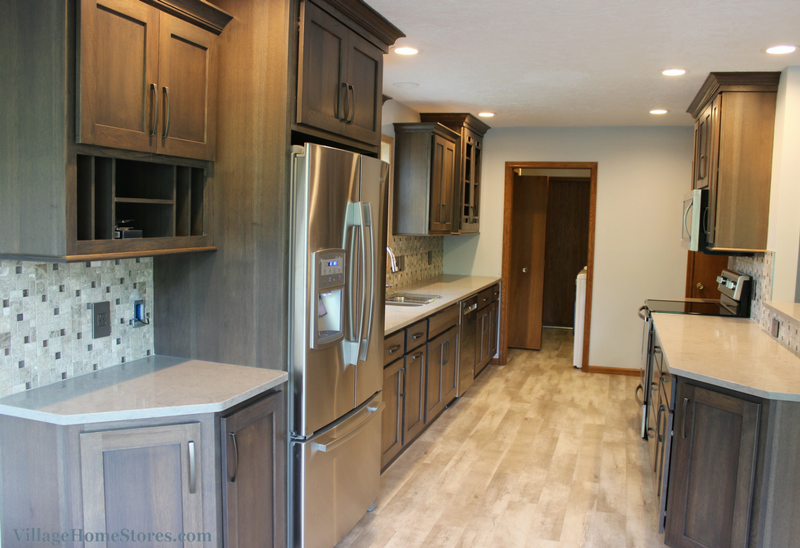 Many of the homes in the Quad Cities region include a layout commonly referred to as a “Galley Kitchen”. This just means that two parallel sections of cabinets and counters make up the kitchen design. When space is limited, a Galley kitchen layout may be the best solution. Soffits were removed from the original space and a section of the original wall was removed to create a more open design into the adjacent living room area. 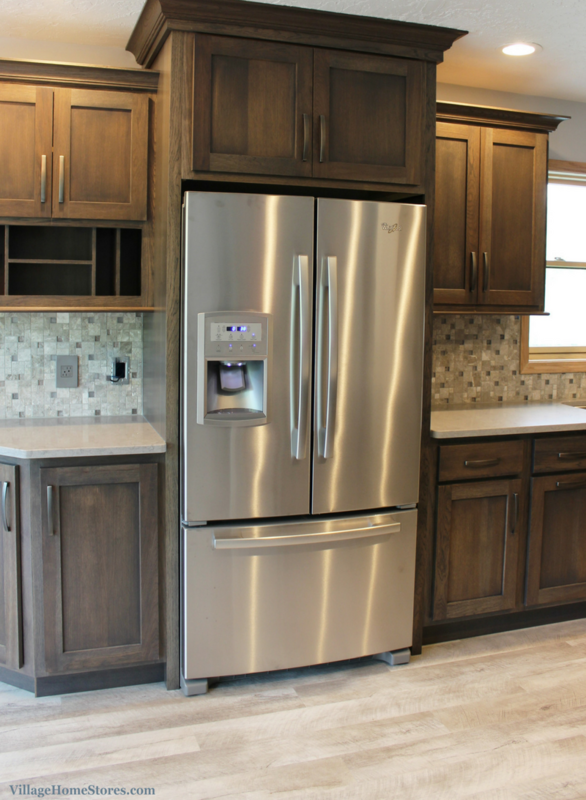 Our team including a cabinet designer, electricians, plumbers, carpenters and our project managers worked with these Bettendorf customers to create a more functional kitchen layout while updating the look of the space. New Luxury Vinyl Plank floors from Mannington have been installed in the “Seaport” series and “Surf” color. In a Galley kitchen layout, it is best to consider maximizing the aisle space between the counters and offering the best storage solutions for the kitchen. Keeping the center aisle space as open as possible helps allow a user to be at an appliance or the kitchen sink and still allow someone to pass behind them. 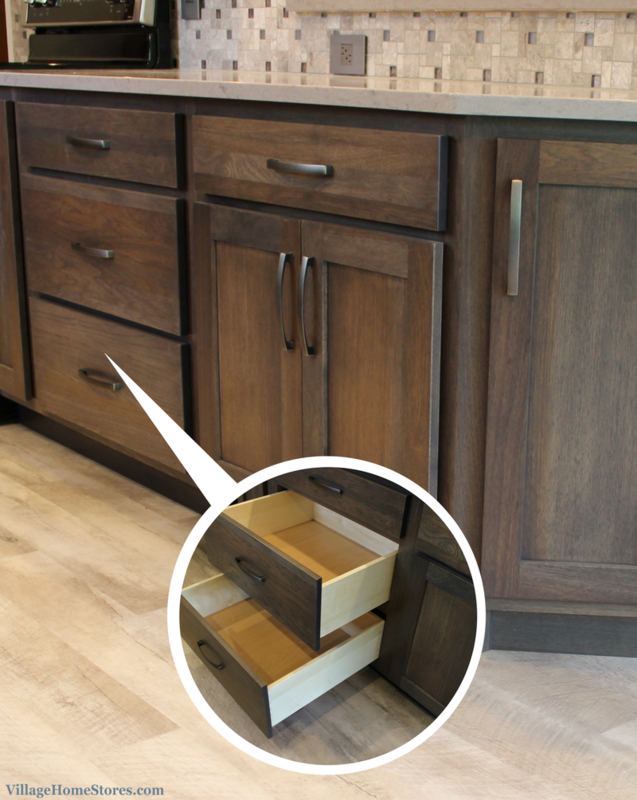 Many times our customers request a large stack of drawers for pots and pans storage in place of a set of doors with slide-out shelves behind them. This makes access to items easier when you are working in the kitchen. The drawer guides for this type of storage are undermounted and installed to accommodate the weight of pots and pans. This kitchen includes a half-wall that has a bar-height countertop that overhangs into the living room. Perfect for adding stools for dining and even leaning against when entertaining. 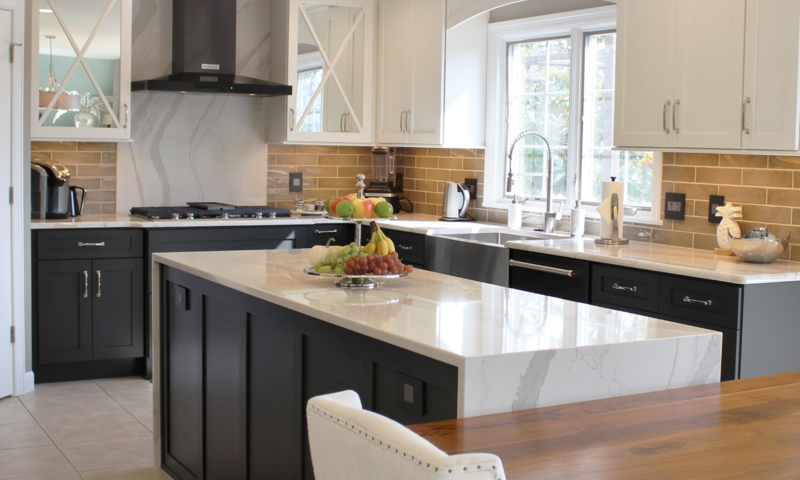 The quartz in this kitchen is from Caesarstone in the “Symphony Grey” design and standard eased edge profile. The refrigerator used to be located down near the doorway into the kitchen. This made the room seem crowded right upon entering it. A new counter-depth refrigerator is located now closer to the “end” of the kitchen. A “counter-depth” refrigerator just means that the entire unit is shallower than a standard one. 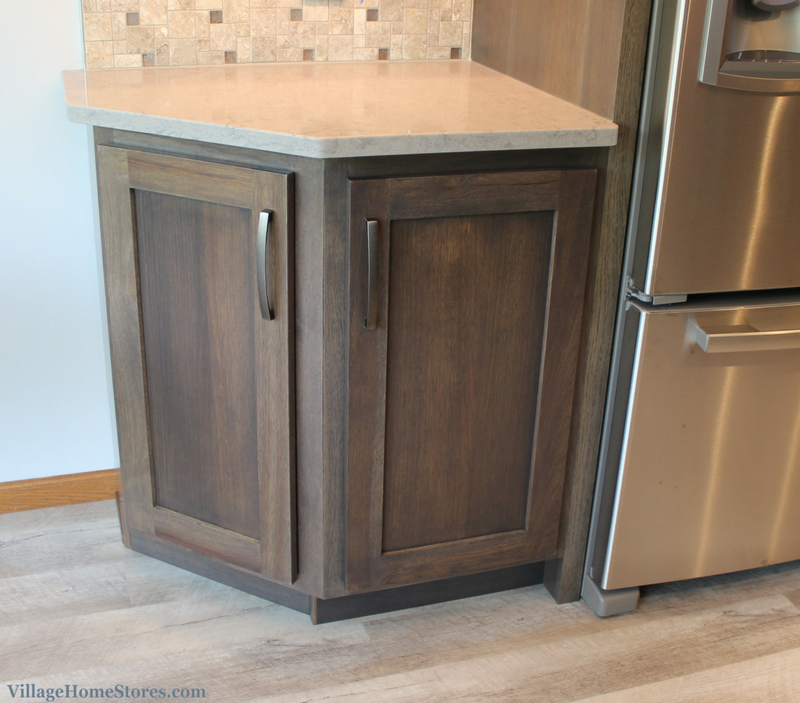 A standard refrigerator can extend many inches into the kitchen walkway, this unit sits back with the cabinetry allowing maximum traffic flow. In a Galley layout, that space is valuable! This French Door unit from Whirlpool® is 20 cu. ft. and even includes an external ice/water dispenser. Including a sit-down desk in a kitchen layout has become a thing of the past. No body wants to miss out on space for storage where a desk seating area may have been. 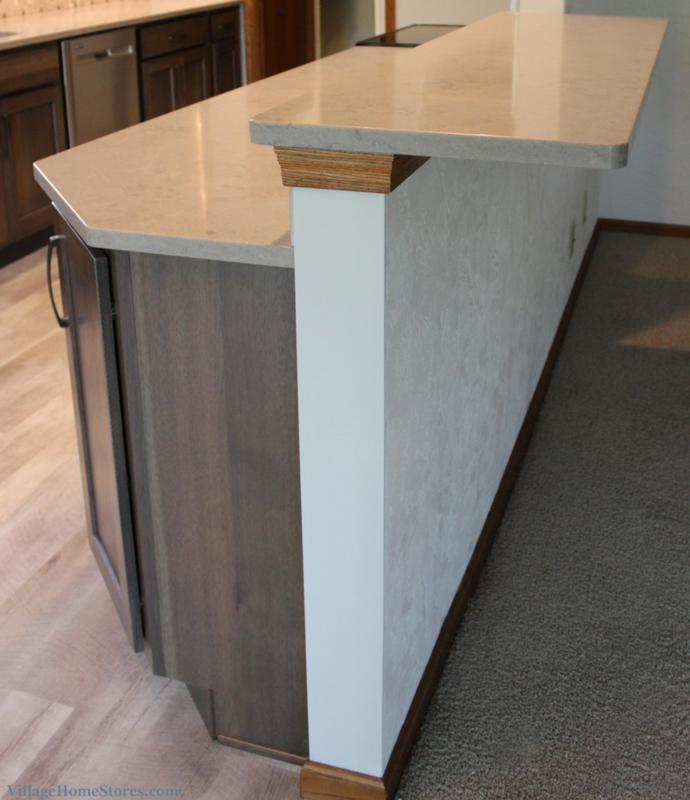 Instead, many who work in the kitchen choose to do so at an island or a bar-height top like the one in this layout. But what about the piles? Every kitchen countertop no matter how large the family ends up with the piles! This kitchen design includes a mail organizer cabinet. A mail organizer is a modification that can be made to a wall cabinet to give a place to sort and store mail, keys, calendars, tablets, coupons, etc. Many times we are even installing an outlet in these cabinets to create a charging station. Speaking of power, all of the new switches and outlets in the kitchen have been replaced with the Adorne series by legrand. 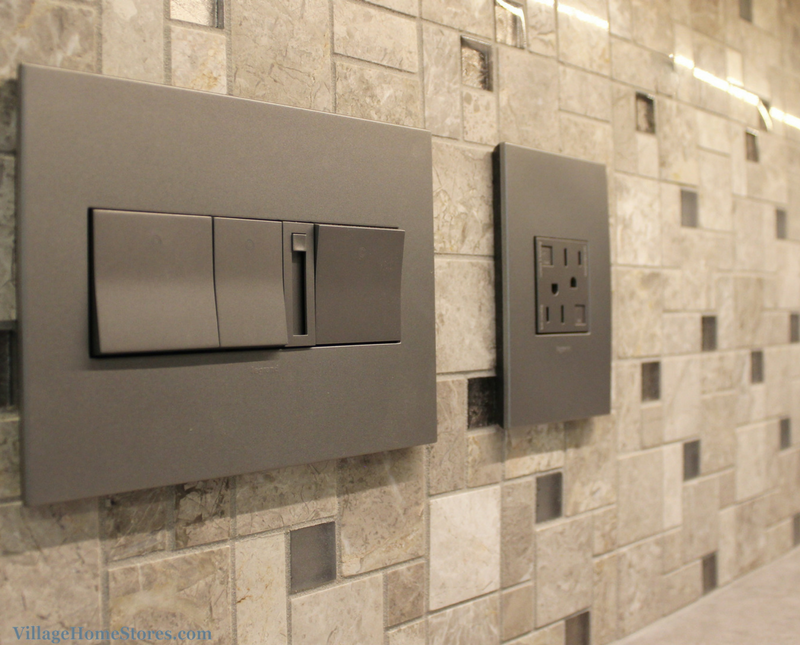 This stylish system is available in a variety of custom options and finishes. Stop in our store today to learn more and see this system in person! The tiled backsplash in this kitchen is a wonderful example of finding a tile that ties all the other finishes together perfectly. The tile is from our Jeffrey Court line in the “Pietra Opus” series and “Winward Plains” color. 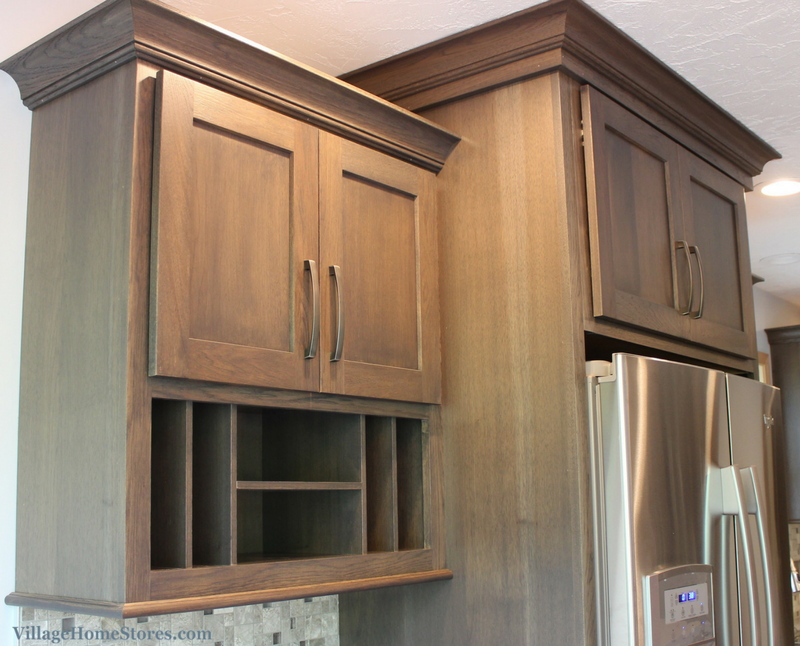 Cabinetry for this kitchen design is from our Koch Classic line in the “Savannah” door. A hickory wood has been stained in the warm gray “Stone” finish. The cabinet finish is truly stunning in person! Hickory is the perfect wood to showcase this “Stone” stain. The natural hickory woodgrain is highlighted by the stain and in this home filled with oak trim, it is a perfect compliment. The variation of the wood from panel to panel and even the rails and stiles of the doors is noticeable and beautiful. 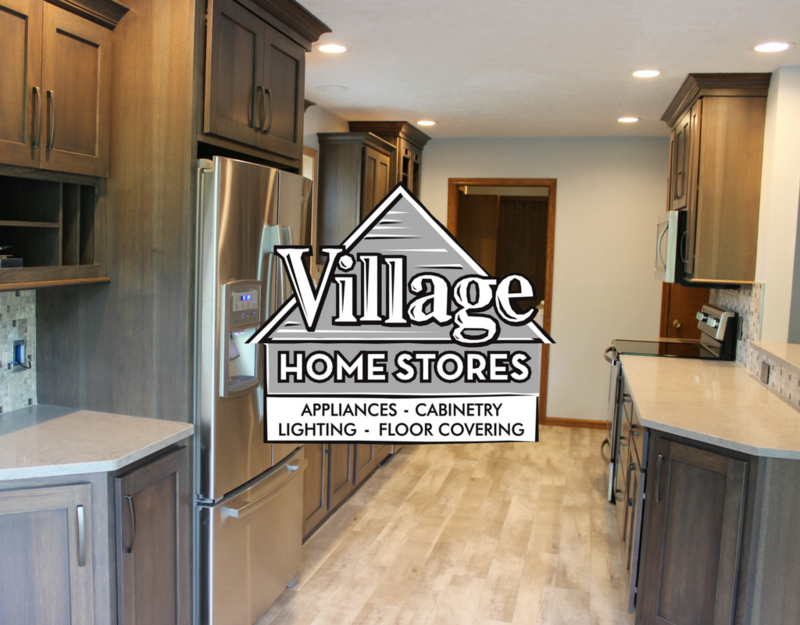 The complete Project Management Program at Village Home Stores means that we manage everything for your from start to finish. 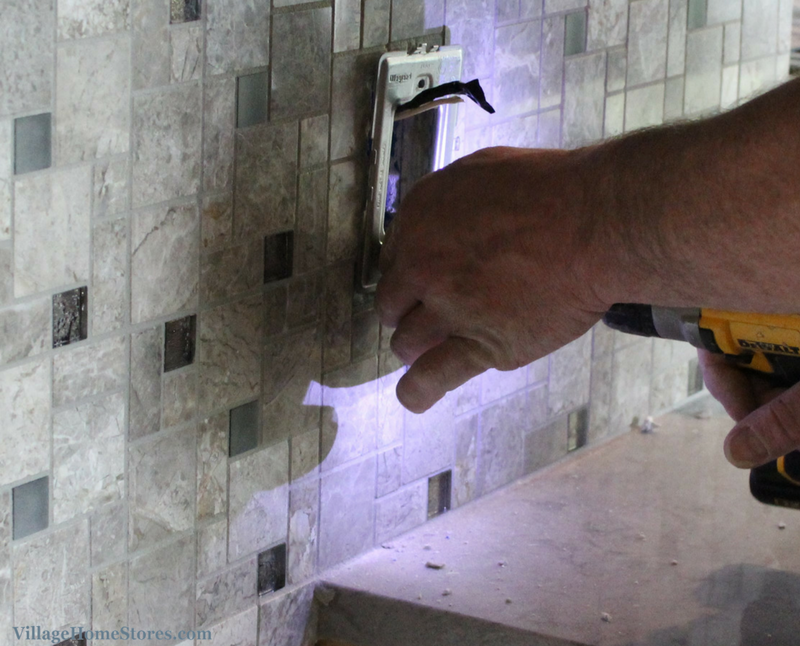 We handle coordinating a meeting of all subcontractors to provide accurate estimates that can help us build a realistic timeline and schedule for your project. 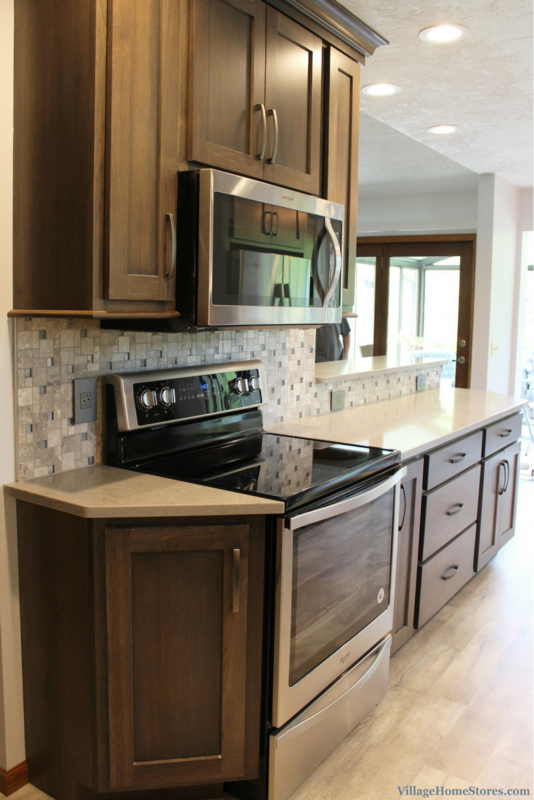 Love the look of this project and want to save some ideas for your own dream kitchen? Be sure to check out the full album of images here on our award-winning Houzz page and save some to your own Houzz ideabooks. Contact our store today to make an appointment so we can start forming the perfect team for your own project. 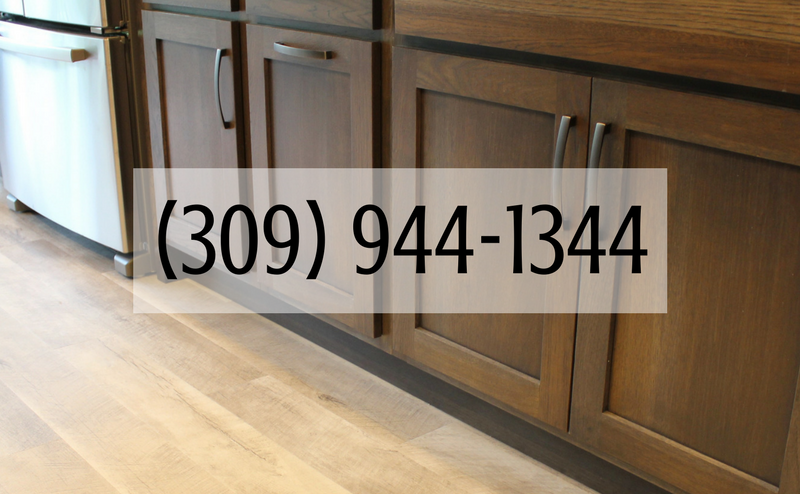 Contact us online here at this link or call (309) 944-1344.